Walnuts and ground flaxseeds are especially rich in omega-3 fats, which lower inflammation throughout your body. The good news about nuts and seeds is that eating the right portion can help you loose or maintain weight and they can also stabilize your blood sugar levels. improve your cholesterol and triglycerides, which may reduce the risk of type 2 diabetes and heart disease. Posted on June 7, 2014, in International, Main Course and tagged drchdietfood, flaxseed, Flaxseed Pesto Pasta, Nuts Pesto Pasta, Pesto, Pesto Pasta, vegetarian recipes, Whole wheat Pasta, Whole wheat Pesto Pasta. Bookmark the permalink. 15 Comments. Whenever I hear of a new healthy ingredient, I can’t wait to go buy it, without first learning how to use it, of course. 🙂 So, my pantry is filled with all kinds of stuff, including flaxseeds, and without fail, I then neglect them. Typical! So I’m very glad to come across your recipe using flaxseeds. Now I can actually eat healthy, instead of just thinking about it! I know how healthy flaxseeds are, and I add them into cereals and salads, but haven’t try yet in pasta. Looks yummy! 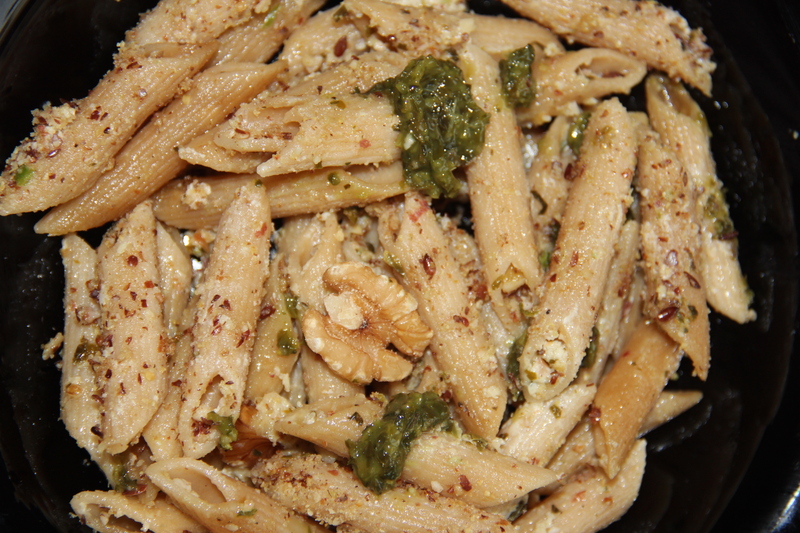 Thanks Mila….flaxseeds added crunchiness to dry pasta along with other nuts….